Manage your entire business through a single, centralized dashboard. Automatically sync data across 30+ premium listing sites and manage it all through one unified calendar, inbox, and reservation system. MyVR provides a multichannel view as well as control of your operations to increase efficiency and help you scale. Quickly add additional marketing channels and watch your revenue grow. Build independence as you diversify and create your own marketing presence. Centralized management helps you avoid dreaded double bookings and improves your operational efficiencies. Make life easier by automating repetitive daily tasks. Spend less time running your business and more time growing it. Our smart tools help boost conversion with immediate responses, scheduled communications, and proactive conversion tracking. Operate your business more effectively in less time using software instead of hiring more people or working around the clock. Automatically keep all your marketing channels in sync and avoid awkward double bookings with one centralized calendar. 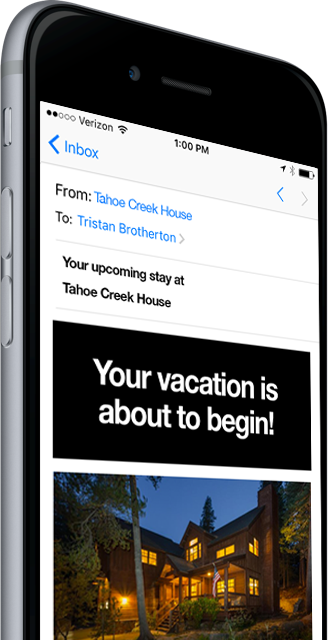 Never miss an inquiry by adding email autoresponders to your booking process. Avoid frustrating out-of-date calendars and double-bookings by keeping your marketing channels automatically in sync. Stay on top of payments, deposits, and renter communications with powerful automation tools. MyVR has created an open and extensible platform for vacation rental management. Our integrated applications and service providers put endless functionality at your fingertips. Connect your management software to apps you already know and love. As our apps marketplace grows, so does the functionality available to your business. We believe you should have full access to your data anytime, anywhere. Our rich set of import/export tools and powerful APIs put you in full control. Our service marketplace allows you to connect with expert service providers who can help take your business to the next level.